With Rock ‘n’ Roll Chicago in a few weeks [eekkkkk! ], I have started thinking about what I am going to do while I am in the windy city! Any recommendations Chicago natives and friends?! Once settled into my AirBnB, I am heading out for my training miles for the day – 15. While I could have run before catching my flight in the morning, it is a little more exciting to use the time to explore the city! 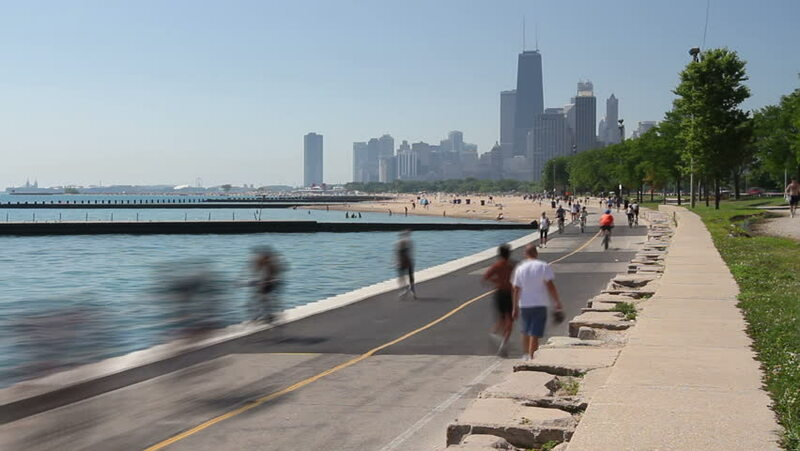 Or just head out to the Chicago Lakefront Trail. Not only will I be exploring the city by foot on Saturday afternoon, I will also be exploring on Sunday morning for the half marathon! Join me! As you may have heard on the BibRave Podcast a little while ago, I earned my degree in Landscape Architecture. While I have not used it, I am still completely drawn to green spaces – and Chicago is full of them! Per Tim’s suggestion, I am going to search out Maggie Daley Park to spend a little time and people watch. I recently listened some older episodes of the Billy Yang podcast and earlier this year he interviewed T.K. Pillan. I was inspired by there conversation and I wanted to see if Veggie Grill, the restraunt started by T.K., was in the Chicago area and before I could google it, they discussed how one would open early this year! Exciting! It looks like there are at least 2 locations to choose from – so I will have to make that my lunch stop on Saturday. Interested in running Rock ‘n’ Roll Chicago with me (and 15K+ other runners) at the end of July? Use the code “RNRBRP2018” for $15 off the half marathon distance! I’d love to hear from you! Leave a comment and start a conversation! Will you be in Chicago for the Rock ‘n’ Roll race series? I might be a little bias since it’s a Milwaukee based chain, but Collectivo Coffee is amazing!! I think there are two locations in the city, one in Lakeview and one…somewhere. Where is your AirBnB? I love Elaine’s and Collectivo. If you finish your run before 2, the Green City Market is right across the street from Elaine’s and right off the LFT. That’s how we end our runs most Saturdays! Veggie Grill is really good and pretty close to there (about a mile north) and Collectivo is in between Elaine’s and Veggie Grill. That could be too much coffee?? Maggie Daley Park is really cool – a great public space. I’m running RnR, too, with a friend from high school. I’d love to meet up! Fun! I am up for exploring for sure – I am staying in/near Chinatown. I’ll have to check out the market on Saturday for sure! I’ll be there Saturday for the 5k and Sunday probably for the 10k. Intelligentsia is Chicago’s hometown coffee even though it was bought by Peet’s. Caffe Streets on Division is good, so is Caffe Umbria on Clark. Maggie Daley Park is right next to (East) of Millennium Park. Its beautiful. I hope I see you!